Level 1 on the Squamish Rain-o-Meter is dewy. It doesn’t seem to be raining but there’s mist on your face. There’s enough vapour in the air to remind you that your own act of respiration—the simple fact of your breathing—injects you into the heart and the start of the water cycle. Don’t just breathe easier, embrace the rain and breathe wilder. Anything and everything is up for grabs today. A little mist in the air makes the day that much more dramatic, bundle up in your coziest sweater and pack a rain jacket just in case. Enjoy the day outside with one of these signature Squamish activities. View a list of Squamish's hiking trails here. Cash in on the clear views and check out the vistas from the Stawamus Chief trail or the Murrin Park Loop Trail. A trail wet with dew is fat with anticipation and ready to be enjoyed. Reap the benefits of dewy air; better grip, less dust and the serenity of having the trail to yourself. Choose a wind or sun-exposed spot such as Area 44 or the Smoke Bluffs and enjoy a cool day craging outside. Hike up and spend the night staring up at the stars in one of Squamish's many backcountry camping spots. Soar above the clouds and take a peek at the weather as you have never seen it before. 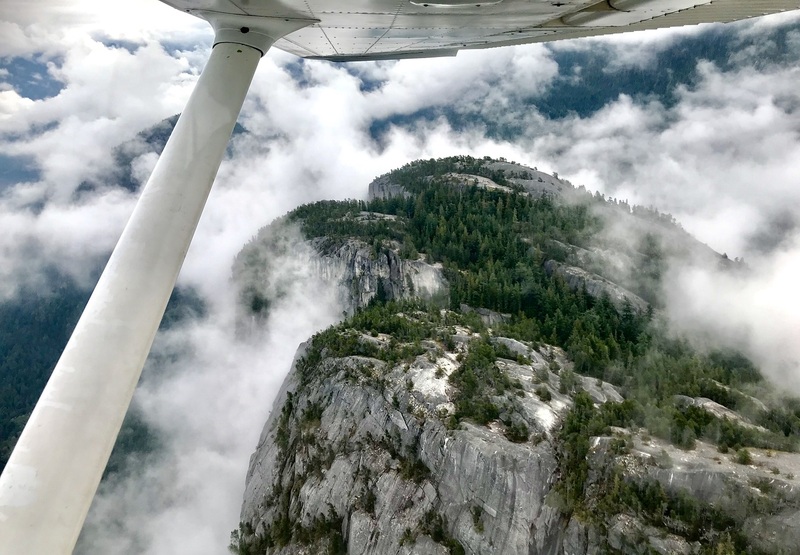 Watch the mist clinging to the cliffs of the Stawamus Chief and dive below the clouds for an up-close encounter with the stunning mountainscape Squamish. Dress in layers and listen to the ocean lapping gently against the shore. It's the perfect way to bathe yourself in the light and connect with the water cycle from an arm's length. Grab your camera and head outside to spot some of Squamish's unique wildlife. Plenty of birds, dear and marine life call Squamish home. Like you, many animals enjoy spending time under clear skies; today is a good day to take a look. See the legendary sights of Squamish on a thrilling two-wheeled adventure through our beautiful mountain town. Dewy days are perfect for exploring dirt and gravel roads without the hassle of dust, view a list of recommended places to ride here. The views from the Stawamus Chief are among the best in all of Squamish. Dewy days make this vertical grind more comfortable quenching your thirst for air as you make your way to the peak. At the top, you will be rewarded with breathtaking views and fewer people on the trail. Be extra cautious on the way down, wear grippy footwear and watch your step!